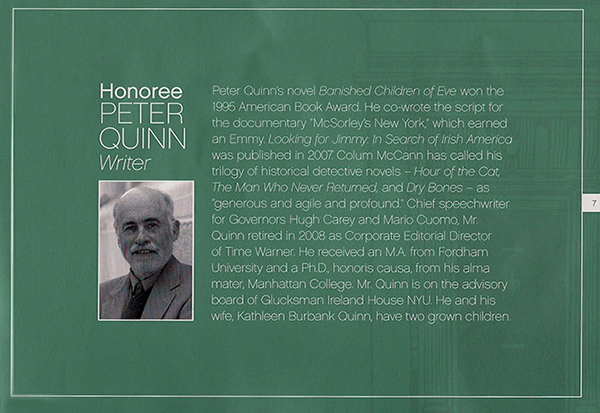 On Feb. 24th, the Gluckman Ireland House of New York Universityhonored the lasting achievements of two of its most esteemed members: Author Peter Quinn and Global Head of Marketing, Communications and Government Affairs at McGraw Hill Financial Ted Smyth with the Seamus Heaney Award and the Lew L. Glucksman Award respectively. Author and historian Terry Golway served as the evening's master of ceremonies and legendary journalist Pete Hamill was on hand to honor the achievements of Quinn to a star-studded audience at NYU’s Kimmel Center for Student Life. A quote from NYU's President John Sexton: " The depth and range of our two honorees reflect those of Gluckman Ireland House itself. At once a center for study, a cultural venue, and a destination for world leaders, Ireland House resonates vibrantlywith a multitude of communities, from students and neighbors at Washington Square, to expatriates and descendants of immigrants, to scholars and artists from across the globe."